← Conservation for the sake of our children is far more important than mere cost. 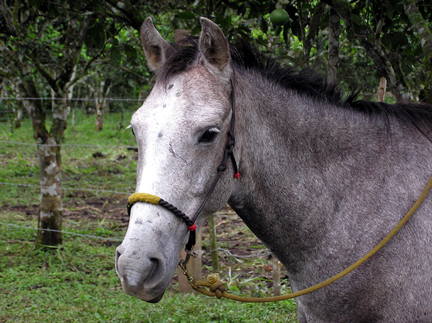 Yesterday afternoon, our Colombian Paso Fino gelding, Flash, died at the age of about nine. That amounts to three horses dead in about six months, all apparently from piroplasmosis, a tick borne disease that affects red blood cells. First Teka died, then Flash’s daughter Sizzler and yesterday Flash. As the red blood cells deteriorate, the blood can no longer be oxygenated adequately, respiration and heartbeat accelerate to compensate for the deficiency and death, often sooner but sometimes later, results. Our worker, Daniel, had been bathing all of our horses regularly with the solution our veterinarian had prescribed for ticks and other insects. Fortunately, blood tests on two remaining horses, at least for now, show that they are not infected. Flash was a sweet, gentle and beautiful horse. When we bought him at the age of about four years, he had never carried a saddle. I was the first to back him, a gradual process taking over a month. After he had come to know me a bit we did ground work on a lounge line. Then, he came to accept a saddle without objection. Then, a bit of my weight in his near side (left) stirrup. Then, a bit more as I put all of my weight in his near-side stirrup. Finally, I gained the saddle without objection. With daily ground work in our training area, first on a lounge line and eventually at liberty, we got to know each other well and he came to do as I asked. When mounted, very slight shifts in position and barely perceptible rein movements were sufficient to communicate with him. Flash tended to be very sensitive and hence very nervous. Once several years ago, we were working in the training area and an empty concrete sack placed on the ground by some workers who had been building a thatch-roofed shelter nearby on our finca was picked up by a gust of wind and came flying toward us. Flash must have jumped half way across the ring to our right. It took him only a few seconds to respond to my efforts to calm him down. I had pulled a tailor muscle and, after riding him back to where I could dismount and tether him, I was unable walk or ride for a few days without lots of pain. Flash seemed to suffer no similar discomfort and we soon got back to working together. Eventually, after trying all of the desensitizing techniques I knew and was able to discover, I was again eager to ride him most anywhere and he offered no objections. 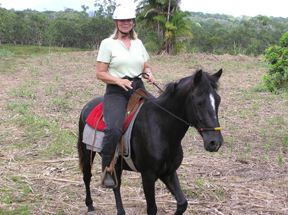 My wife, Jeanie, also loved to ride Flash and relished his company. He was her favorite horse from the beginning, even before he became ours. She just reminded me that Flash was once part of a large herd of about twenty and that they were routinely given vitamin shots. To accomplish this, a worker corralled and immobilized them by tying them tightly to a fence. A needle was then thrown in like a dart and the syringe fastened. That causes the needle to wiggle about and is a very unpleasant; there are far easier and less traumatic ways to give intramuscular injections and our horses accept them without objection. Jeanie saw that Flash was terrified; she went to him, covered his eyes and hugged him. He was immediately calmed, a special bond was developed and from then on he was her favorite. His death upset both of us greatly. As is normal with Paso Finos, Flash did not trot. 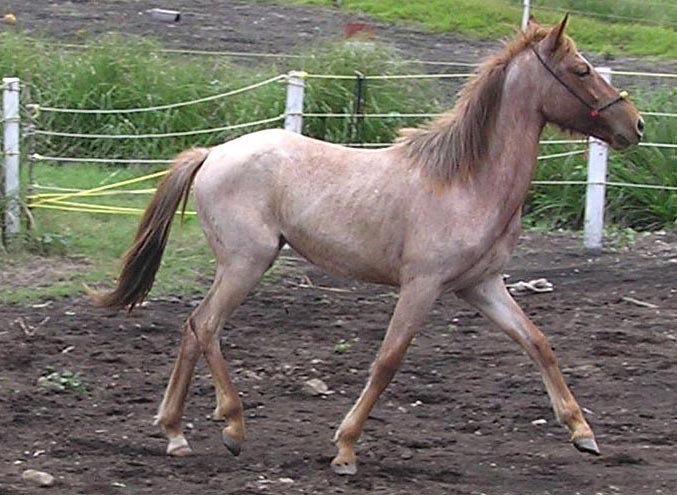 Instead, he had a lateral gait somewhat similar to that of a Tennessee Walker. The lateral gait is much smoother than a trot, a diagonal gait with lots of ups and downs. Paso Finos can go for hours without tiring themselves or their riders, at about the same speed as another horse at a trot. Fast forward. The veterinarian, whom we were unable to reach on December 8th due to a major Panamanian holiday, Mother’s Day, came the next morning. Flash’s red blood count was low but since I had injected him with Imidocarb-LH as the vet had previously prescribed should the same apparent illness that had killed two of our other horses appear, we all thought and hoped that Flash could recover. The vet administered a couple of IVs and injected more Imidocarb-LH. Over the next few days, Flash appeared to have ceased deteriorating but seemed to be improving very slowly if at all; despite appearing to do little more than to stabilize we anticipated a full recovery, likely to take weeks. He ate only a little bit of grass, drank some water but refused grain. He walked only a bit and otherwise remained standing. Then, at around 3:00 p.m. yesterday, he lay down and died. He was buried yesterday afternoon. We will both miss him very, very much. 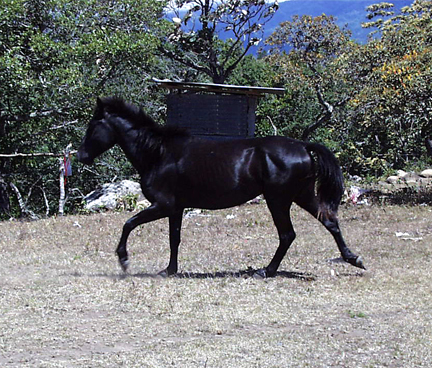 This entry was posted in Death, Horses, Panama, Piroplasmosis and tagged red blood cells, tick borne disease. Bookmark the permalink. 5 Responses to Another death in the family. Thanks for your reply. I just got it today…better later than never. I am interested in the blood tests done and I wonder if the vet did them and is it common to check for piroplasmosis there? How specialized are the blood tests, or are they more basic like a CBC? Yes, the vet — a highly respected Panamanian large animal vet — did the tests. I have no idea whether such tests are common but they should be when the symptoms are similar. Unfortunately, by the time that obvious symptoms appear and diagnoses can be made, the horse is often dead. What kind of testing was done on the horses to confirm piroplasmosis? There were blood tests as well as observations. His urine developed a reddish color, an IM injection caused drops of blood to form at the injection site (I’ve done many and aside from bleeding at the injection site by the other horses who had previously died with the same symptoms had never seen it). The lack of oxygenation of his blood was also apparent from his rapid breathing.